Hong Kong, April 17, 2019 – Eight Partnership helped revitalise the Zung Fu brand through an updated visual identity and a comprehensive launch campaign for the rollout of its new Mercedes-Benz Brand Centre expanding the 65-year-old brand’s appeal to a new generation of car-lovers. For the launch, Eight created a campaign around the tagline “More to Enjoy” demonstrating the brand’s commitment to customer satisfaction, consisting of a thematic video, key visuals and print advertisements. The video will be available both online and as a television advertisement, marking the launch as well as introducing the range of new after-sales services designed for customer convenience. The video is supported by a series of print advertisements developed by Eight to communicate the core messages of “Showroom Enjoyment”, “Family-Friendly” and “Convenience”, developed from a city-wide market research study. This rebrand is also timed with the launch of the new Mercedes-Benz Brand Centre on Hong Kong Island - the city’s largest car showroom - which demonstrates Zung Fu’s new commitment to customer convenience and enjoyment for the whole family. The 9-storey Brand Centre with over 440,000 square feet is the Hong Kong headquarter of Zung Fu Group, featuring the Mercedes-Benz Showroom, Service Centre, Central Parts Warehouse, Training Centre, Event Venue and Used Car Centre. The centre has been designed to give customers a more enjoyable experience with a large range of Mercedes-Benz vehicles available under one roof, a fully integrated after-sales service centre, as well as leisure facilities for the whole family such as the kids room, bistro and roof terrace. Zung Fu Company Limited is the exclusive retailer of Mercedes-Benz automobiles in Hong Kong and Macau, and expanding into Southern and Western China, operating Mercedes-Benz retail stores and service centres. Today, Mercedes-Benz’s share of the automotive market in Hong Kong is one of the highest for Mercedes-Benz worldwide. Zung Fu is a subsidiary of the Jardine Motors Group, which is a member of the Jardine Matheson Group. 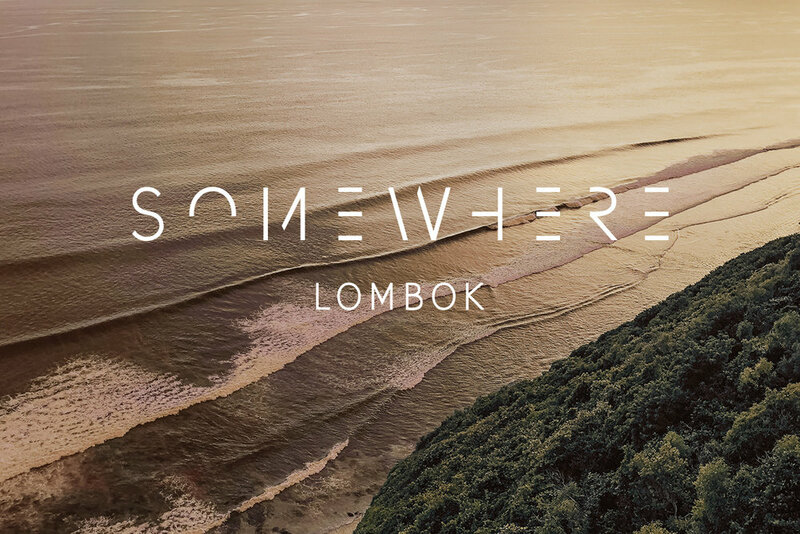 Hong Kong, January 29, 2019 – Eight announced today the unveiling of Somewhere, a new and contemporary hospitality brand to be launched in Lombok, Indonesia. With a beach-chic vibe and a focus on wellness and wellbeing, the project is designed to deliver a special brand of natural and responsible hospitality. The new resort is currently under development and is located on the beautiful south coast of the island overlooking a magnificent bay with a secret world-class surf break. The off-the-beaten-path location inspired the name which carries the promise of hidden gems that are worth seeking out around the world. This is further emphasised in the visual identity that makes use of vanishing letter-strokes, taking inspiration from footprints in the sand that are washed away by the sea. Somewhere is a lifestyle hospitality brand created by Claire & Valia Gontard. With their combined backgrounds in investment, events, travel and hospitality, the Franco-Chinese sisters united to bring to life their vision of a special destination for modern travellers. Embracing their Indonesian roots and heritage, the duo scouted the island of Lombok for many years in search of the perfect location for their first property. 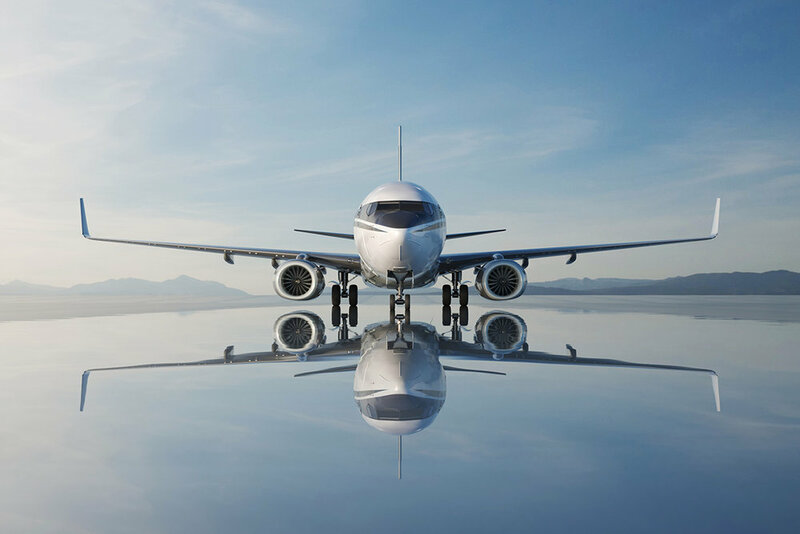 Hong Kong, January 7, 2019 – Eight Partnership and HAECO Private Jet Solutions (“HAECO PJS”) today announced an alliance agreement focused on the private jet market. Under the terms of the collaborative partnership, Eight will manage a design front-office for private jet cabin interiors and exteriors, while HAECO PJS will perform the industrial design, engineering, certification, cabin completion and airframe maintenance. The partnership between the two firms will initially focus on the private jet markets in the Greater Asia and Middle East regions. Demand in this segment has increased since the release of the BBJ MAX from Boeing and the ACJneo from Airbus, with both platforms now offering new engines capable of extended-range flights. HAECO was founded in 1950 and is one of the world’s leading aircraft engineering and maintenance groups. With around 17,000 staff and 17 subsidiaries and affiliates. It operates HAECO PJS, the first and only Airbus-approved and Boeing-licensed cabin completion centre in Asia Pacific. Hong Kong, August 23, 2018 – Eight recently completed a full-scale rebrand of Capital Tower, a 24-story, 63,000 square meter Grade A office building in the affluent business and commercial district of Gangnam in Seoul, South Korea. The newly repositioned building – “Arc Place” – was transformed into an inspiring modern workplace which can help lift tenancy and rental yield and contribute to the newfound vibrancy of the district, better meeting the needs of leading companies like Facebook, which houses its country headquarters in the building. In 2016, Blackstone acquired Capital Tower and chose Eight to articulate a fresh brand strategy which could be woven into the physical spaces of the building. Eight crafted a strategy that married the warmth and style of a residential home or chic boutique hotel with the feel of a modern workplace, seamlessly blending work, life and play and creating a brand that appeals to both new-generation businesses and traditional corporate tenants. The Arc Place brand and visual identity were extracted from the physical foundations of the building itself. The logo was designed to refer to structural arches visible within the building’s ground floor, with an elegant typeface to suggest stability and the building’s open and airy feel. The color palette was inspired by the materials used in the building’s interior design, in particular bronze, wood and marble. The new name and visual identity, including Eight’s designs for signage and way-finding, aim to position the building as a greatly upgraded workplace environment and a warm counterpoint to the surrounding traditional buildings, perfectly suited to the requirements of the new generation of workers and businesses in the buzzing district of Gangnam. Designed by Italian architect Piero Lissoni, The Middle House is Swire Hotel’s fourth property under The House Collective family and their sixth hotel in Asia. Its name is woven closely to its sister properties - The Upper House in Hong Kong, The Opposite House in Beijing and The Temple House in Chengdu. It also refers to the historic district of Dazhongli (大中里) where it is located. For the Chinese restaurant, Eight developed the name Sui Tang Li (随堂里) which is a reference to the two dynasties, the Sui and the Tang, which marked a cultural peak in the history of China. In addition, the name has a connotation of ease and relaxation, which correlates with the atmosphere of a club. Eight then developed the visual identity, drawing inspiration from the signature spiral staircase designed by Lissoni that connects three levels within the building. The name of the Italian restaurant, Frasca, which means ‘branch’ in Italian, refers to the concept of dining outdoors in vineyards. As a result, Eight developed a visual identity reminiscent of vines and leaves. The logo is a combination of symbols for a roof, a glass of wine and a platter. Eight also worked with Frasca to create collaterals for the restaurant, the interiors of which were designed by Italian stylist and creative consultant, Cristina Vignoli. Swire Hotels has been created to manage soulfully individual hotels in Hong Kong, Mainland China and the USA, providing a characterful experience for well travelled individually minded travellers who seek originality, style and personalised service. We create distinctive hotels with a sense of place that break with convention. The company’s first hotel, The Opposite House in Beijing, opened in 2008 and was followed by The Upper House, Hong Kong, and then by EAST, Hong Kong, EAST, Beijing, The Temple House, Chengdu and EAST, Miami. The Middle House in Shanghai opened in April 2018. A restaurant division was set up in 2013 to manage the company’s stand-alone restaurant operations. Our first restaurant Plat du Jour opened in November 2013 followed by Public and Ground Public in Quarry Bay. The Continental in Pacific Place opened in October 2014 and Mr & Mrs Fox in 2015, follow by the second Plat du Jour opened in Pacific Place in 2016. Our latest addition, Republic, a sub-brand of Public opened in Taikoo Place in December 2017. Hong Kong, July 10, 2018 – Eight Partnership collaborated with Hysan to create Hysan95, a documentary initiative featuring the people and places of Causeway Bay. The stories of Hysan95 appear on a dedicated multi-media platform, social media and in a larger than life exhibition at Lee Theatre Plaza until July 12. The year-long project began when Hysan Development wanted to celebrate its historical relationship with Causeway Bay in the 95th anniversary of the year Lee Hysan acquired Jardine’s Hill. Since then, the area has become one of the most prominent and significant parts of Causeway Bay, and arguably one of the most well-known in Hong Kong. The Hysan95 platform weaves the stories of the district’s past, present and future together to celebrate the neighbourhood and its real, colourful characters. “As a long-time fan of the district, this project has allowed all of us to better appreciate and understand the community in a way that also lets us bring these stories alive for others,” says Elaine Yeung, Account Director at Eight. Eight will develop 95 stories for the project, overseeing the creative, editorial, photography and design direction to ensure it reflects the diversity of the community. Eight worked with young photography talents Nikki Li and Vivian Liu on the series of portraits, urban landscapes and street snaps. The stories can be seen on Facebook, Instagram and on the dedicated website (http://www.hysan95.com/). Hong Kong, May 23, 2018 - Eight was tasked by the Swire Hotels team to create a print advertising campaign to announce the launch of The Middle House. Drawing inspiration from the idea of “intimate grandeur” the advertisement showcases the hotel’s opulent entrance, photographed by Michael Weber. Designed by Italian architect Piero Lissoni, The Middle House is Swire Hotel’s fourth property under The House Collective and is their sixth hotel in Asia. The new hotel’s name is woven closely to its sister properties - The Upper House in Hong Kong, The Opposite House in Beijing and The Temple House in Chengdu. The Middle House name refers to the historic district of Dazhongli (大中里) where it is located. “We are very excited to collaborate with Swire Hotels on the launch of this landmark property,” says Bjorn Fjelddahl, Partner. The company’s first hotel, The Opposite House in Beijing, opened in 2008 and was followed by The Upper House, Hong Kong, and then by EAST, Hong Kong, EAST, Beijing, The Temple House, Chengdu and EAST, Miami. The Middle House in Shanghai is scheduled to open in April 2018. Xintiandi is a flagship social destination created by China Xintiandi. The original Xintiandi sits at the heart of Tai Ping Qiao in Shanghai and was launched in 2001. The concept draws on traditional Shanghainese ‘shikumen’ architecture of low-rise brick buildings to create a retail- focused pedestrian district with shops, entertainment, cafés, restaurants and bars. The runaway success of the pioneering Shanghai neighbourhood has led to the creation of similar districts in other locations around China, notably in Wuhan, Chongqing and Foshan. Shanghai Xintiandi receives over 70,000 visitors a day and the collection of Xintiandi destinations in China drew over 100 million visitors in 2017. 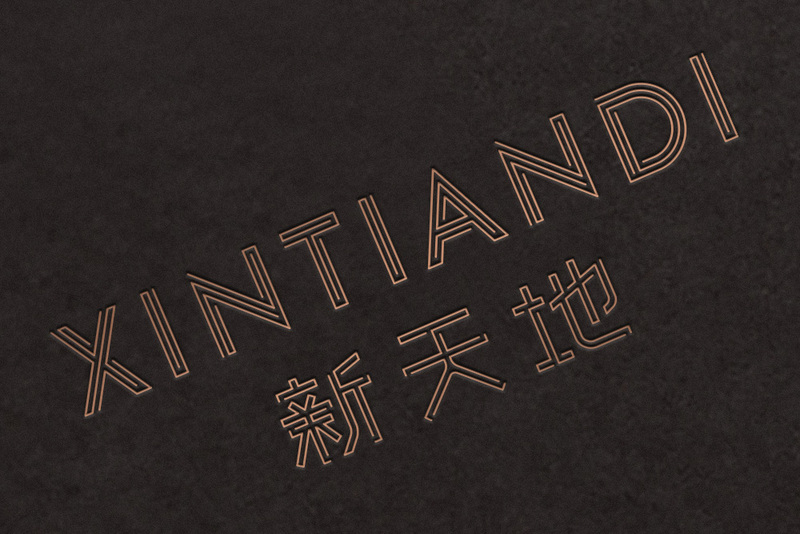 The expansion of the Xintiandi concept across China resulted in individual identities for each location. Eight was brought in to harmonise the numerous individual identities, creating a strong national brand for China Xintiandi and consolidating its customer-facing identity. Visually, the new wordmark was inspired by a bird’s eye view of the charming alleyways that compose the original Xintiandi district in Shanghai. The labyrinthine lines in the wordmark symbolise the destination’s ability to generate a sense of exploration and discovery around vibrant and thriving public spaces. The mark also moves away from the original heritage imagery in favour of something that modernises the look and feel across all the locations and is flexible enough to encompass all existing destinations as well as future ones under the Xintiandi umbrella. China Xintiandi is an investor, operator and manager of premium commercial properties in China, nurturing vibrant communities and commercially thriving districts built around the idea of ‘live, work and play’. As the owner and manager of Shanghai Xintiandi, the company delivers innovative experiences for consumers and long-term value for businesses guided by their mission to ‘bring places to life, and life to places’. As a separately managed, wholly owned subsidiary of Shui On Land, China Xintiandi’s portfolio under management includes retail, office, hotel, cultural and entertainment properties in Shanghai, Chongqing, Wuhan and Foshan. Hong Kong, April 12, 2018 - Eight was part of the team that helped Thai hospitality group Dusit International to develop an exciting new hotel concept designed to meet the expectations of modern travellers. Asai Hotels is an Asian-inspired collection of hotels connecting curious travellers to vibrant neighbourhoods around the world. Eight worked with Dusit to develop the new brand at an early stage, especially its positioning and visual identity. “Inspired by community and driven by sustainability, Asai is an exciting new concept for Dusit that will leverage the company’s 70 years of hospitality heritage to deliver a new kind of stay experience in vibrant neighbourhoods worldwide,” said Siradej Donavanik, Managing Director of Asai Holdings Co Ltd, Dusit International. “The brand has been carefully crafted to meet the needs of millennial-minded travellers who seek authentic local experiences”. With each property embracing a sustainable, community-focused concept designed to reflect the culture and heritage of its location through collaborations with local artisans, Asai Hotels are set to appear in interesting districts and neighbourhoods in various cities around the world. So far a total of six properties have been confirmed for the new brand, with the first hotel in Bangkok’s renowned Chatuchak Market. Five more properties are expected to open in 2019, including three in Cebu, Philippines, one in Yangon, Myanmar and a second hotel in Bangkok, in the stylish Sathorn district. Hong Kong, Feb 6, 2018 - Eight has unveiled a cluster of new websites to support the continued expansion of client Odin property in Japan. Odin, the Niseko-centric hospitality and real estate brand has been growing steadily, having announced a number of new retail and restaurant ventures during the past 12 months. The flagship Odin Place retail property launched last winter at the heart of Hirafu has quickly established itself as the social nexus of the ski resort, bringing brands such as Moncler and Burton Snowboards to Niseko for the very first time. Tenants include a local brewery taproom, an authentic alpine fondue restaurant, an artisan bakery, a bistro & après-ski bar, a sushi restaurant, two luxury skiwear stores and a lifestyle property office. Odin’s rapid expansion has included a number of retail brands, including the creation and operation of a bakery named Koko, a bar/bistro called Musu, and an alpine restaurant dubbed The Alpinist. Eight has art-directed photography, written content, and designed and built the websites for all of Odin’s new ventures. The websites can be viewed immediately at odin-property.com, alpinistniseko.com, musuniseko.com, kokoniseko.com and nisekobarn.com. Odin is also a co-investment client of newly announced Eight Capital Partners. Hong Kong, Jan 22, 2018 - Eight is today showcasing a new industrial design project created for non-profit organisation, Urban Land Institute. The trophy, designed by Eight, aims to communicate simplicity and humanity, taking the simple form of the numeral “1” crafted in walnut and matt brass. The Urban Land Institute is one of the world’s most active and respected non-profit organisations working to spread knowledge and best practices for responsible urbanisation and city-making. It was founded in 1936 and counts over 40,000 members. The world’s leading real-estate players are members of ULI. Human-centric city-making and urbanisation are some of the core themes promoted by ULI. “As a member of ULI ourselves, this industrial design brief was an opportunity we couldn’t pass up,“ says Richardson. Hong Kong, Jan 9, 2018 - Eight Partnership is today announcing the launch of Eight Capital Partners, a private equity business dedicated to design and creative-led real estate investment. The unit will leverage two decades of expertise in repositioning property assets, making them more liveable, more inspiring, and ultimately, more financially valuable. 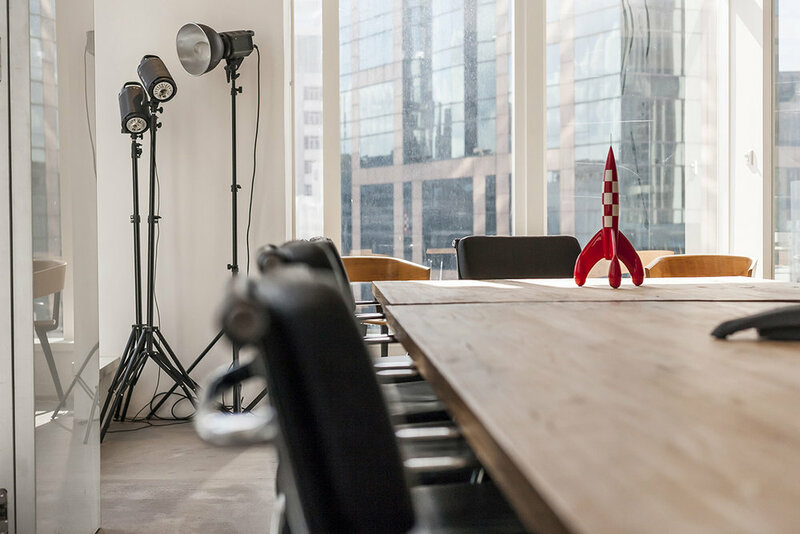 Experience working with clients such as Blackstone, Swire Properties, Mori Building and Xintiandi has provided Eight with the blueprint for successful real estate transformations. Design and creativity are now recognised by leading investors as some of the most impactful drivers of value in real estate. By repositioning assets through branding and design as well as bringing in the right content - new retail concepts, restaurants, bars and entertainment, art and culture, events - Eight Capital’s work will significantly drive value. This can be done with single buildings, clusters of buildings or complete neighbourhoods. “Beyond bringing investment capabilities to the table, Eight Capital is really about assembling the right team of competent and culturally compatible partners - the so-called ‘smart money’ of real estate around each specific project.” says Bjorn Fjelddahl, Managing Partner at Eight. One of Eight Capital’s most significant projects to date is Odin Property in Niseko, on the northern island of Hokkaido, Japan. Since 2007, the investment has grown into a portfolio of successful residential, hospitality and retail assets, both new builds and renovations. Integral to the Odin brand is the creation of hospitality and entertainment venues that add life and buzz to buildings, including multiple F&B concepts and innovative collaborations with high-powered retail brands such as Moncler and Burton Snowboards. Eight Partner, Chris Fjelddahl says that the new division is the culmination of the firm’s long-standing real estate in Asia and globally. Find out more about Eight Capital Partners here. Hong Kong, August 1, 2017 - Eight Partnership has designed a new cinema experience for THX, the sound quality assurance and certified theatre business originally developed by Lucasfilm at Skywalker Ranch. The new brand called THX Revelation, will be launched in Beijing and is the first of its kind anywhere in the world. It will allow visitors to experience the specific acoustic, architectural and technical aspects that drive and enhance the THX experience. Eight developed the brand’s visual identity, the space interior design for the auditorium, and designed the new ‘Origami’ chair. Inspired by the mysterious and ominous Star Wars heritage of the brand’s founders, the THX Revelation is wrapped in a high-performance precision-driven look and feel, with countless design references to the technological nature of THX acoustic expertise. The ‘Origami’ chair was designed by a team led by Chris Fjelddahl, and is inspired by THX's origins as the creators of Star Wars and specifically the character of Darth Vader. It looks like a pilot’s seat with angular, geometric design language reminiscent of the acoustic reflectors found in professional sound chambers. “In the interiors, we avoided any overt cyber-look, opting instead for a more threatening and mysterious ambiance created by the choice of brass lighting fixtures, and a very dramatic entrance-way.” says Chris Fjelddahl. 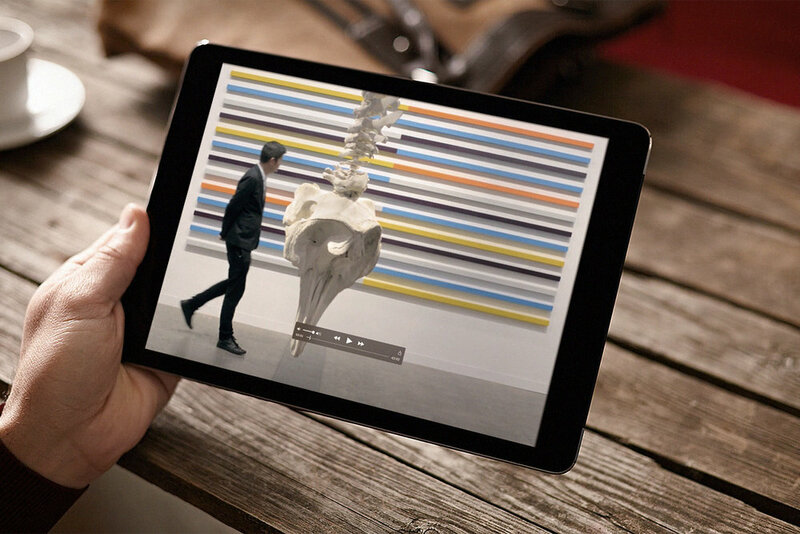 “This was really a fun project, and we’re proud to be associated with such a strong brand, with such a cult-following." Hong Kong, April 4, 2017 - Eight and product designer Jamie McLellan have won Germany’s prestigious Red Dot award for product design for their work with Cathay Pacific on the airline’s inflight Premium Economy cutlery. Based on a nesting design that celebrates space efficiency, the three-piece cutlery set plays on the airline’s contemporary Asian design influences. The cutlery is part of the new dining collection, introduced in 2016, which was designed by Eight in collaboration with the New Zealand-based McLellan, for use in the Premium Economy and Economy class cabins on Cathay Pacific and Cathay Dragon. With an average of 130,000 meals served per day across the two airlines, meeting the challenges of high volumes and tight space limitations were key requirements. Like the nesting cutlery design, the entire dining collection features an arrangement of refined, simply shaped dishes that fit neatly with one another, a configuration inspired by the compact utility of Japanese ‘bento’ boxes. Eight’s role in developing the collection is a continuation of an ongoing brand refresh and realignment process started with Cathay Pacific in 2014. Hong Kong, February 1, 2017 — Eight Partnership has helped design and launch Odin Place in Niseko, Japan, one of Asia’s premiere ski resorts. Located at the main intersection of Niseko-Hirafu, Odin Place is a chalet-inspired destination with a diverse range of retail and dining options. Eight sought to take the vision of the founders of Odin to create a distinctive, modern alpine signature for Odin Place. Eight collaborated with Bohlin Cywinski Jackson (BCJ), the award-winning architects known for their Apple stores and the much-celebrated Grand Teton National Park visitor center. Odin Place is a three-storey building with an exposed metal structure, capped by a signature sloping roofline to emphasise the stunning view of Mount Yotei. It also features a central chimney and a fireplace on each floor. Eight’s team, led by Bjorn Fjelddahl, designed the interiors where the warmth of the timber complements an authentic exterior cladding and is punctuated by stone accents and large glass windows to allow for generous natural light throughout. Odin Place has attracted brands such as legendary snowboard company Burton, with a flagship store on the ground floor, as well as luxury ski-wear from Moncler and cult label Snow Peak. Dining options for visitors during the day or night range from Koko, a café and bakery concept, The Alpinist for more hearty fare as well as the bar and bistro Musu - all designed by Eight. The Niseko Taproom offers local craft beer, while visitors can arrange activities through the Explore Niseko information centre. Hong Kong, January 17, 2016 — Eight Partnership has created a new a bar and bistro to stir up the après ski scene in Niseko. 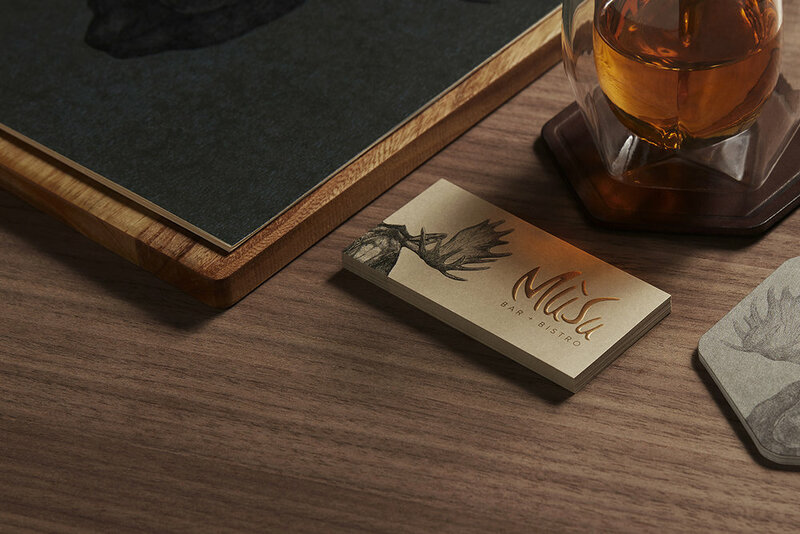 Inspired by the iconic après ski bars in the tradition of great resorts in Europe and North America, Eight developed the concept, the brand identity and the interiors for Mūsu around the desire for skiers to share stories, food and drink around a crackling fireplace after a long day on the slopes. Extending the analogy into the interiors, Eight selected materials such as leather, wood and fur and used them throughout the space to further reflect elements of the natural habitat of this charming beast. Mūsu features an open fireplace with cosy leather lounge seating, reminiscent of an alpine den. The bar counter is designed around an imposing backlit shelf-wall and a collection of faux moose heads looks over the action from the grand chimney. Eight collaborated with Burton, the legendary snowboard brand, on the staff uniform designs in order to further deliver a truly alpine après ski experience. Hong Kong, December 14, 2016 - Eight Partnership has developed and designed The Alpinist, a new dining concept in Niseko, Japan, one of Asia’s premiere ski destinations. Eight was in charge of every aspect of the project from creative direction and brand articulation to interior design and execution. Located at the very heart of Niseko-Hirafu, The Alpinist serves up a modern take on traditional alpine dining experiences. The concept is based on the idea of a fictional mountaineer and the visual identity, together with the interiors of the restaurant, aim to deliver a balance of Alpine heritage and modernism. The menu features traditional Alpine cuisine with classics such as authentic fondue, raclette, crepes, soups and salads. The storytelling approach informed the process of creating the visual identity and interiors, richly conveying the romance of the mountains with a contemporary twist. This balance was applied throughout the process including the use of materials where aged and weathered timber, stone and wool were combined with modern design elements and colours to bring the narrative to life. Eight developed the interiors as a homogeneous extension of the brand story and features, among other things, an imposing, beautiful fireplace as a signature centrepiece and an imposing central communal table with lighting inspired by traditional cow bells. The space is punctuated by a curated selection of vintage alpinism related artifacts inspired by a mountain lifestyle. The Alpinist will open on December 16, 2016 in time for the 2016/2017 winter season. Hong Kong, November 21, 2016 - Eight Partnership has worked in close collaboration with Cathay Pacific, Hong Kong’s global premium airline, to officially launch a rebranded Cathay Dragon - the award-winning, full-service, regional airline previously known as Dragonair. In the lead up to today’s launch, Eight contributed to a comprehensive overhaul of the brand system starting with brand strategy, visual identity, livery and airport signage. Additionally, Eight helped to design and develop inflight items such as new crew uniform accessories, snack packaging, menus, destination postcards and playing cards. Cathay Pacific’s manager for Brand, Ruaraidh Smeaton, says Cathay Dragon will become an even more significant part of Cathay Pacific’s global reach, bringing travellers to and from China and the region, via its hub in Hong Kong. “In preparing for the launch, our teams across multiple departments worked closely with Eight to identify and design the brand touchpoints that would resonate with passengers and staff,” he said. Passengers of Cathay Dragon will notice the use of the iconic brushwing on uniform accessories of both cockpit and cabin crew as well as contemporary Chinese accents during the inflight dining experience. Eight also designed a suite of communications items aimed at the staff of Cathay Dragon and Cathay Pacific. These include large-scale display items at both Cathay City and Cathay Dragon House, as well as a short film that introduces the airline group. Hong Kong, October 26, 2016 - The history-laden Hong Kong Golf Club has unveiled a refreshed visual identity designed by Eight. The new logo retains the iconic elements of the traditional shield, originally designed in 1889, and modernises it to make it more compatible for modern media applications, especially in the digital space. Eight worked closely with Vice Captain Arnold Wong and General Manager Ian Gardner who consulted widely with past captains and a number of prominent club figures on the new look logo and brand guidelines. “We dug deeply into the history of the Golf Club to identify the drivers of the brand and leveraged the proud heritage that is so important to its legacy,” says Chris Fjelddahl, Partner at Eight. A contemporary logo design evolved from the original version to represent the Hong Kong Golf Club as it continues to thrive in an ever-changing future, and to maintain the positioning of the club as a progressive and forward looking world-class sporting institution, respectful and aware of its proud history. The initiative to refresh the brand identity was driven by the need to increase clarity, improve usability in new media, and create distinctiveness in cluttered visual environments. The new logo is built around a simplified version of the shield elements, including an updated dragon motif, English and Chinese mottos using blue and gold as the primary colours. The roll-out of the new logo and streamlined identity for communications will commence in late October with the merchandise design roll-out following in November in anticipation of the UBS Hong Kong Open in December. Hong Kong, September 12, 2016 – Cathay Pacific has launched a series of short films, created and produced in collaboration with Eight Partnership, about its Marco Polo Club members. Telling the personal stories of three members, the films are a companion to a series of books profiling more than 15 of the global airline’s Marco Polo Club members. To be shown on Cathay Pacific’s social media platforms and later inflight, the films feature a chef, a curator and a businessman with a passion for sailing. May Chow is the chef and founder of Little Bao, Aric Chen is the Lead Curator for Design and Architecture at the upcoming visual arts museum M+ and Harvey Jessop is known to have put the “wonder” into Wonderbra. 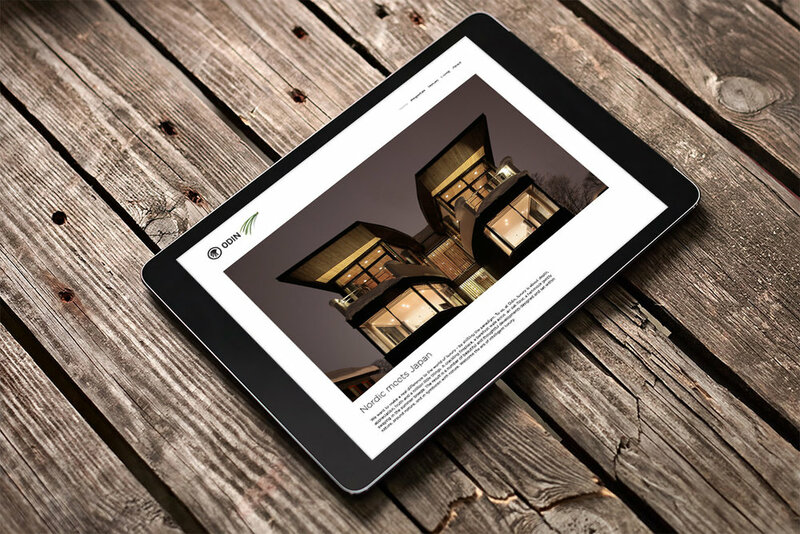 The new content is part of the brand, design and communications approach for Marco Polo Club that was launched with the help of Eight in April this year to place greater emphasis on the sense of belonging and the diversity of the club’s membership. Using an editorial approach, the films and books depict members in a personal and honest way that make their stories more powerful.